Pest description and damage Several species of spider mites can cause damage to deciduous, evergreen and coniferous ornamental plants. Appearance of these mites varies with the species, although all are 0.02 inches or smaller. Adults and nymphs can be yellowish, greenish, or reddish brown, depending on species. Female European red mites are round with red bodies; males are yellowish-red. 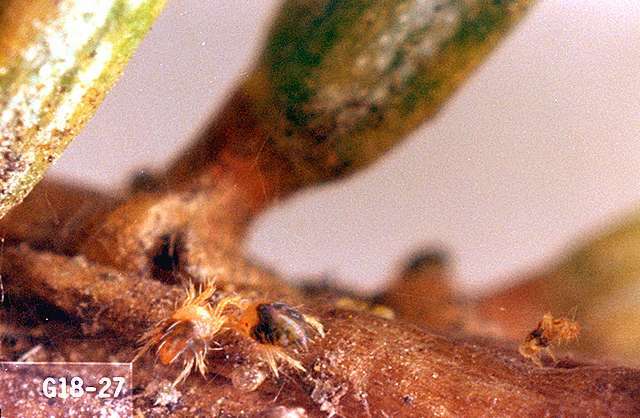 Twospotted spider mites are oval and yellowish-brown or green with distinctive black spots on the body. Plants may be covered with fine silk webbing at branch axils or leaf mid-veins, small plants may be engulfed in webbing under heavy infestations. Biology and life history Most mite species share a similar life cycle. Most species overwinter as eggs on host plants, although some may overwinter as adult females. Mites become active in the spring. There may be eight to ten overlapping generations per year. Pest monitoring Observe the leaves for mites and/or mite eggs, stippling, or webbing and check for the presence of predator mites. Sufficient biological control usually is achieved by midsummer. Using a stick, hit a branch over a white paper to see if mites (moving dust specks) or natural enemies are present. The keys to the successful use of predator mites are identifying the appropriate mite for the pest mite to be controlled, good scouting, and releasing the mites at the proper threshold. 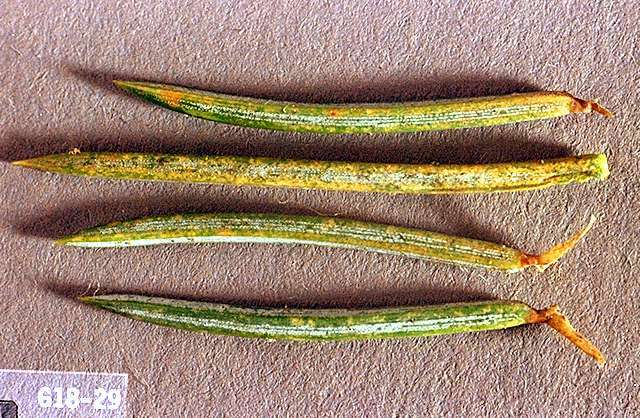 The predator mite Neoseiulus fallacis has been used successfully to control many mite species including bamboo and spider mites if broad-spectrum insecticide applications are avoided. If one mite is found per five leaves inspected, it is time to release the predator mites (check with supplier). These low levels of pests are not usually noticed without a rigorous scouting program. N. fallacis in particular requires 80% humidity, easily found in the canopy of plants grown in the Northwest. Insect predators of mites include lady beetle adults and larvae, lacewing larvae, thrips, and minute pirate bugs. Hold a clipboard with white paper under branches, then give the branch a sharp rap with a stick to dislodge mites. The black specks on the paper that begin to walk away are mites. Also check to ensure you know the difference between pest and predator mites. Severe infestations can be treated by removing infested leaves on plants (where practical) and burning or otherwise disposing of the foliage. Then the remaining foliage then can be treated more effectively for mites. This treatment may be the only practical solution for heavily infested sites, where chemical application presents difficulties (proximity to surface water, food crops or on indoor plants). Heavy rain and cold weather suppresses mite numbers; while hot dry conditions seem to increase the numbers. Suppression of broadleaf weeds such as mallow, bindweed, white clover, and knotweed or grasses with cultivation may reduce mite numbers. Wash mites from the tree with a strong stream of water. This dislodges dust and dirt that favor an increase in mite numbers. Water trees properly, as drought-stressed trees are more susceptible. Avoid excessive nitrogen applications, as this encourages mites. Since mites thrive under hot dry conditions, increasing humidity with periodic short bursts of water to foliage may help. Monitor before and after to evaluate the effectiveness of management strategies.